Sick kids opened the door for learning about germs and how our bodies fight infections and viruses!This cold has been a doozy. I’ve been sick all of September and the kids are now fighting it too. I tell you, a sick mama trying to take care of three sick kids is not fun! So, I’ve tried to make the best of it and we’ve been taking it pretty easy all month. Lots of self-directed play, a few guided activities and sadly, no outings. We sure are missing African Lion Safari! Since we’ve had a bug in the house all month, once I started to feel a bit better, I decided to focus on teaching the kids about the human body. It’s seriously such a neat topic and I can’t wait until they’re a bit older and we can delve deeper into the body and its functions. We did a little lesson about general anatomy earlier in the week (see it here), so I decided to follow it up with a lesson focused exclusively on what our bodies do when we’re sick. It’s been so neat having the kids talk about their white blood cells and all the germs everywhere. 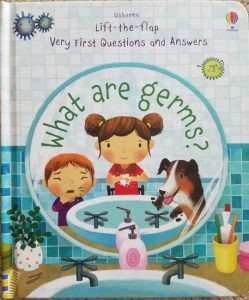 To begin our lesson, I pulled out Usborne’s What is Germs? book (get it here). This is another lift the flap gem, that goes into great detail about what germs are, where they’re found, and how to protect ourselves from them. This book is geared towards younger kids (but still very informative for older kids and adults), so I read it verbatim to them. I also stopped at times to expand on certain points that they book made. The kids of course loved lifting the flaps and peeking under the various pictures! 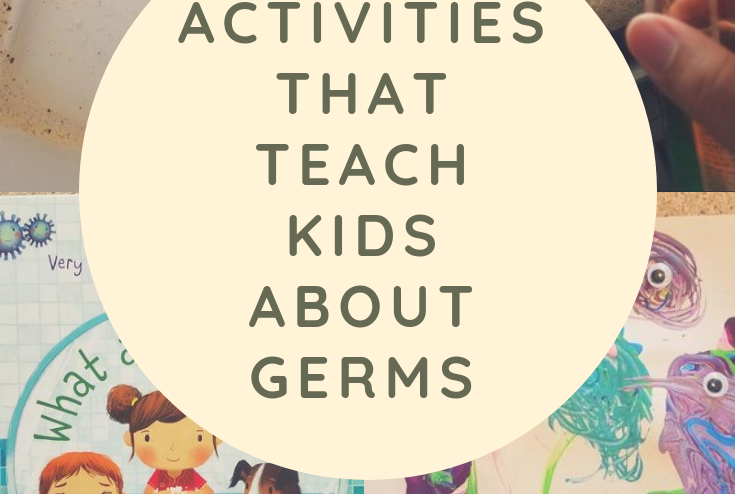 After we finished the book, we did three germ related activities! To do this, I filled an old hairspray bottle with water and added some green food colouring. In hindsight, I think a spray bottle would have been more dramatic, but the hairspray worked just fine. 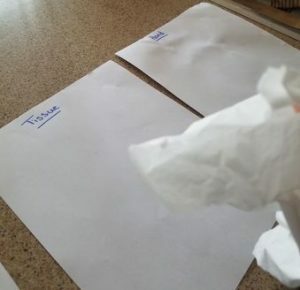 Then I took out three blank pieces of paper and on the first one I wrote “Nothing”; the second, I wrote “Tissue” and the third I wrote “Hands” and I laid them out on the counter top. Once we were all settled in and set up, I talked to the kids about sneezing and coughing and why it’s so important to cover our mouths when we do either. Then I told them to pretend that the spray bottle was someone’s nose and the water inside was a bunch of germs. Then I “sneezed” and sprayed the “germs” all over the nothing page. We discussed how quickly and far germs travel when we don’t cover our mouths when coughing and sneezing, and these are not helpful germs, but germs that will make others sick too. Then I grabbed a tissue, put it in front of the nozzle and “sneezed” again. This time, no germs went on the paper. So we talked about how tissues help keep germs off of people and keep them from spreading everywhere. When I fold up the tissue I made a point of getting some of the “germs” on my hands, so we discussed the importance of hand washing even when we use tissues. 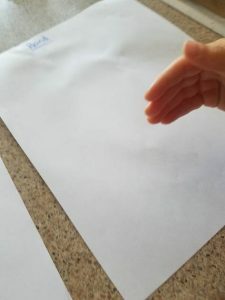 After that, I had Nathaniel put his hand out to block the paper and “sneezed” into his hand. 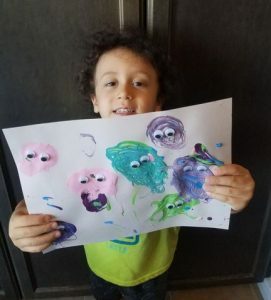 This time, germs spread a bit onto the paper and his hand ended up pretty wet. 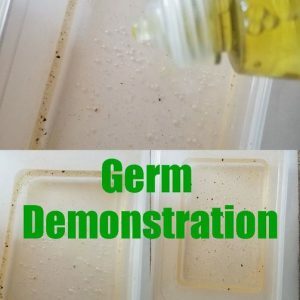 After this we talked about how sometimes even when we block germs they still get out, but it’s still important to try and keep them from going everywhere. Then I pointed out that Nathaniel’s hand was all wet and the kids concluded that hand washing after sneezing was a pretty good idea. 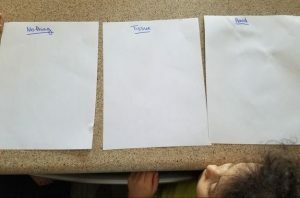 Once I “sneezed” on all three pages, we compared the impact of doing nothing to using tissues and/or hands and of course talked about how we should always wash our hands after no matter what. 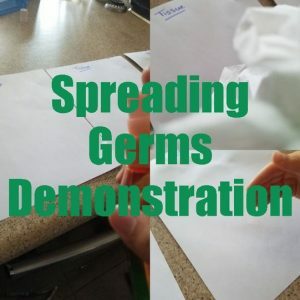 All in all, I thought this was a really quick and fun way to demonstrate how germs move and the importance of blocking coughs and sneezes when sick. 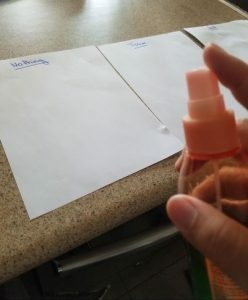 After we finished our discussion, I put away the paper and bottle and pulled out some supplies for our next activity: a sneeze demonstration that I also found on A to Z Kids Stuff. 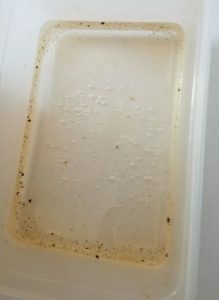 Once I had everything out, I grabbed our pepper mill and did one turn seasoning the water with pepper. I told the kids to pretend that the pepper flakes were germs and then I did another turn and another. After a few turns, I referred back to What Are Germs? and its discussion of how germs multiply. In the story it uses factors of two, so I continued that with the kids and quickly did all of them up to show some basic sequencing (2+2=4; 4+4=8; *+8=16, etc.) As I went up higher, I kept adding more pepper to the water. Eventually, I stopped the sequencing and showed them all of the germs that had rapidly multiplied. We talked about how quickly it happened and how many there were. Then we talked about how to get rid of them. 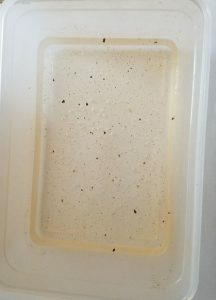 The kids had lots of ideas (which I validated and discussed a bit), but when they said “wash them away,” I enthusiastically said “great idea!” and grabbed a bottle of dish soap and dropped some right in the center of the water. 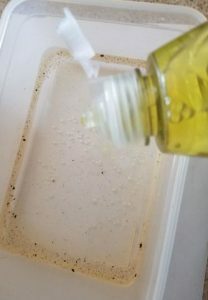 Instantly, the “germs” flew to the sides of the container, leaving the center completely clean. The kids thought this was pretty cool and again gave us a great opportunity to discuss the importance of hand washing for keeping bad germs away. I simply grabbed some cardstock, acrylic paint and cut a straw in half. I used a McDonald’s straw, but I think a straw with a smaller diameter would have been more effective for them. 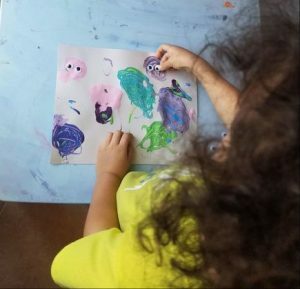 I gave each child a piece of cardstock and piece of the straw and then put a blob of paint on the paper. I then showed them how to blow on the paint so it would spread out and in the process thin out. 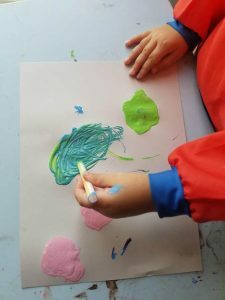 They had a great fun doing this for a bit and then Sophia thought it would be even more fun to mix colours together with her straw and use it as a paintbrush. 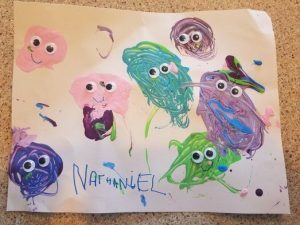 So after we cleaned up the mess, Nathaniel’s piece was quite dry and we were able to add googley eyes to each germ bringing them to life! I’m really hoping that after this weekend we will be at least somewhat back to normal and can get back out on our adventures! I have so many fun trips and activities planned, we just need to get healthy to do them!